A great Garden inial with base. A very elaborated decorations with fruits flowers and garlands. On the top a finial as a fruit basket with grapes and general fruits details. All the area is decorated with hand carved decor, the original pieces are placed on the Villa Cordellina in Montecchio Maggiore in Vicenza area. Carlo Cordellina Molin, a famous Venetian lawyer, began work on the villa in Montecchio Maggiore in 1735 on the site of an old house left to him by his uncle Molin. Architect Giorgio Massari who suggested working in Palladian manner,as can be seen by the facade which is characterised by a pronaos in Ionic style. 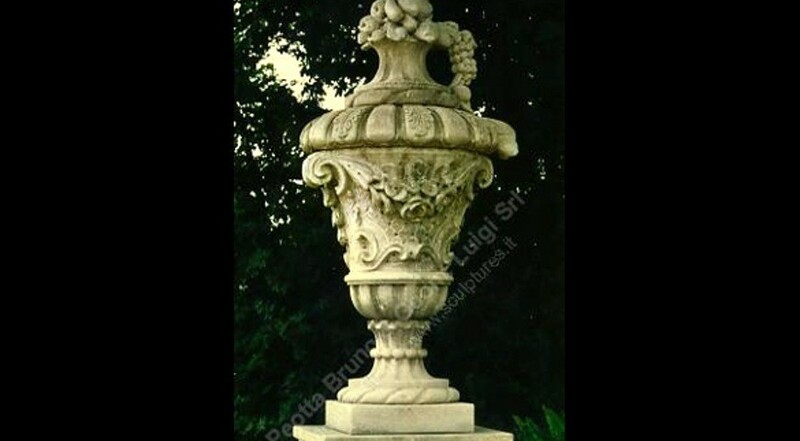 A very nice Baraque forms, in the garden a lot of statues, fountains, vases, fruits basket the typical elements used in all the old Palladian Villas in the Veneto areas. The finials named Cordellina are placed on the top entry gate.